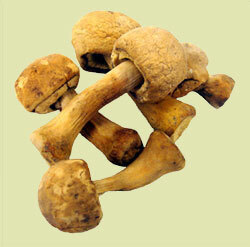 Brazilian mushrooms, with its smooth cap and strong almond flavor, is great sautéed, grilled, or even in soups. As well, its nutritional value makes it an excellent addition to any meal. 1. Stamets, Paul. Mycelium Running. (Berkeley: Ten Speed Press, 2005), p. 208. 2. Stamets, Paul. Mycelium Running. (Berkeley: Ten Speed Press, 2005), p. 209.